Story: Mr. Mole is tired after a long shift at Gordon Ratzy's fancy restaurant. He can't find his glasses, but he's confident he can find his way home regardless. Tunneling away, Mr. Mole keeps popping up in the wrong burrow, getting farther from home as he finds himself kissing a tree filled with owls instead of his wife and bursting through the ice amidst a huddle of penguins. Finally, the smell of worm noodles guides him to where he needs to go, his kids pointing out that his glasses are perched atop his head. 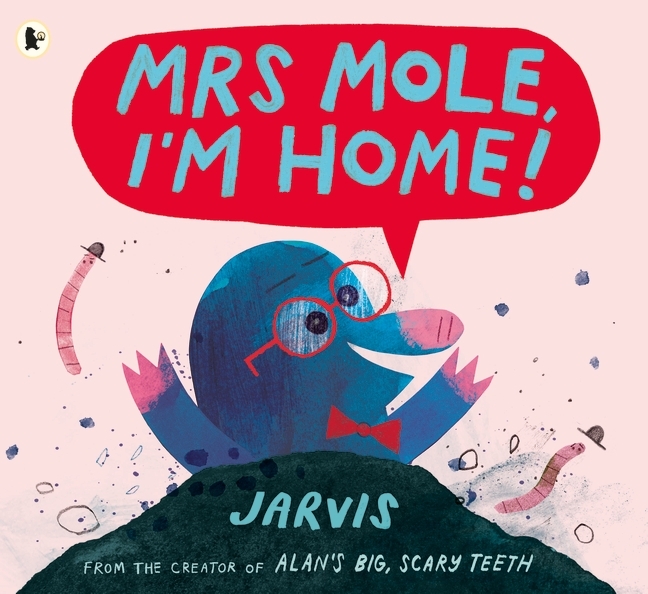 The final page shows Mr. Mole popping out of a hole, shouting, "Mrs. Mole, I'm hooome!" as a fierce lion looks on. Why Read? Why Buy? : Read Mrs. Mole, I'm Home! because it's so stinking fun. Buy it for the same reason - I guarantee your little listeners will want to hear it over and over and you won't get (too) tired of it!